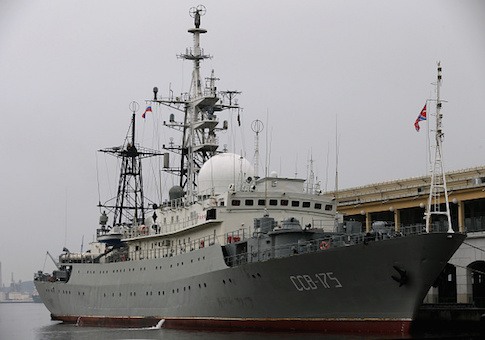 The spy ship Viktor Leonov was spotted leaving Port of Spain in Trinidad and Tobago on Monday after five days on the island, and its current destination is unknown, said two officials familiar with reports of the intelligence gathering ship. "We're monitoring [the ship]. It's an annual thing," said one of the officials. "We've seen it off Cape Canaveral, [Fla.], Kings Bay, [Ga.], Norfolk, [Va.], and New London, [Conn.]." Kings Bay is home to the Navy's Submarine Group 10 that includes 10 nuclear missile submarines as well as special operations submarine forces. Norfolk is the location of the Navy's major East Coast naval base and New London is also a major submarine base near Groton. A second official said the AGI ship, for auxiliary, general intelligence, is being tracked by the Navy and appears similar to previous Russian operations in this region. "What makes it noteworthy is the increase of Russian naval activity worldwide," this official said. "It makes us pay close attention, not to the tactics, but to how this fits into overall Russian naval behavior." The Leonov deployment also is another example of Russia's increase maritime competition with the United States, "this time in our backyard," the second officials said. "Most assume competition will be seen and felt far from home," he said. "This is another reminder that we are an island nation subject to naval competition right off our shores." Last February, the Leonov was followed after sailing some 30 miles off the coast of Connecticut. The ship then moved to waters off Norfolk. President Trump during a press conference in February 2017 told reporters in commenting on the Russian election meddling probe that "the greatest thing I could do is shoot that ship that's 30 miles off shore right out of the water." Two years ago the Leonov was followed loitering around Kings Bay, apparently hunting for departing U.S. ballistic missile submarines. In April 2014, the Leonov and a companion Russian tug, the Nikolay Chiker, were tracked as they conducted operations to spy on undersea cables—an indication Moscow may plan to attack internet connections in a future conflict. The last time Russia dispatched a submarine to waters near the United States was 2012 when the Navy detected an Akula-class attack submarine near the East Coast. That mission was viewed as training for Russian naval forces to locate and sink U.S. missile submarines in a future conflict. Disclosure of the Leonov visit comes as the Pentagon confirmed Moscow's plans to deploy an unmanned underwater drone equipped with a massive, megaton-sized nuclear warhead. The Leonov also may visit Cuba or Nicaragua, the officials said. The officials commented on the Leonov after the activities of the ship were first disclosed by Steffan Watkins, a Canadian security analyst who closely tracks Russian ship movements. Watkins said he used "Somint"—social media intelligence gathering—to trace the Leonov's movements beginning with its mid-December sail from northeastern Russia and crossing the English Channel on Christmas Eve. He also discovered Facebook postings by a Russian suspected of being one of the Leonov's crew members that showed photos of the crew's liberty in Port of Spain. "Viktor Leonov arrived in Port of Spain and departed the morning of Jan. 15 after spending five days restocking her stores," Watkins said, noting past deployments have lasted around six months and included stops at Russian-allied states such as Cuba and Nicaragua. The ship usually spends around two months spying off the East Coast, he said. "I believe their mission is to take inventory of underwater sensors, military undersea cables, sonar, radar, and snooping on rocket telemetry from launches at Cape Canaveral," Watkins said. Watkins said last year's visit by the Leonov coincided with what he said were "wild" media reports that the ship was linked to 2016 Russian election meddling. "But these deployments are military-intelligence related, routine, and unrelated to any president," he said. The Navy likely will deploy a destroyer or the Coast Guard will deploy a cutter to shadow the Leonov, along with surveillance flights by P-8 aircraft, as occurred during last year's spying mission, Watkins said. This entry was posted in National Security and tagged Navy, Pentagon, Russia. Bookmark the permalink.